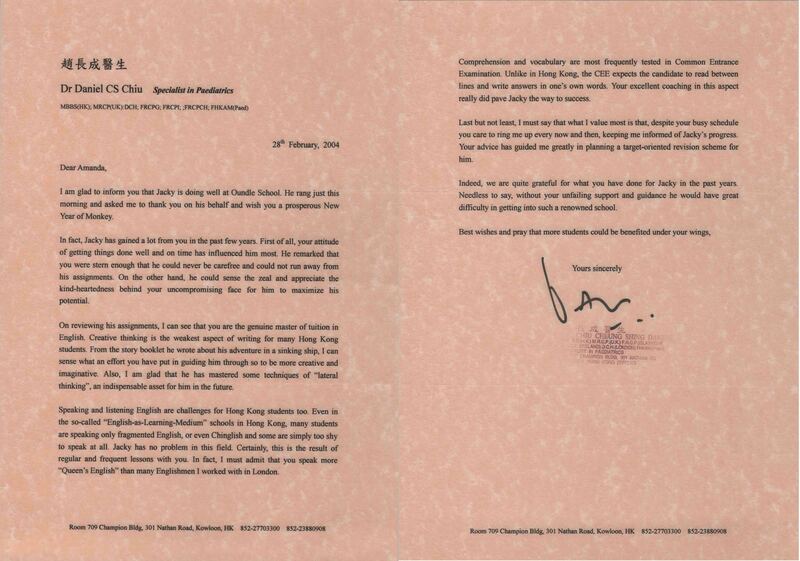 This is written to express my appreciation and gratitude to Miss Amanda Cheuk, who has been my son's English tutor for the past four years. Under Amanda's guidance, my son's English ability has been greatly improved. In June 2000 when my son (Henry) was still a primary school student under the local educational system, my husband and I had plans to have Henry transferred from the local school to Hong Kong International School (HKIS). Understanding that the English standard in HKIS would be much higher than that of a local school, we decided to get an English tutor for Henry. We came to know Amanda through a friend who commended her on her professionalism and dedication to her teaching. From my own experience, my friend's high regard for Amanda as a teacher is not at all over-exaggerated. Just as what I have been told, Amanda is hard working and dedicated to her work. Not only is she hard working, she also expects her students to be hard working. This proves to be really good because it makes the students take Amanda's tutoring seriously. Under such condition, it is just natural for students to make progress. Furthermore, Amanda has the ability to motivate my son, who, consequently, has benefitted tremendously from her tutoring. Before, Henry had great difficulty with his English writing. Now he can write with much more ease and confidence. I know this change would never have occurred without Amanda's help. For this, I want to say a big "Thank You" to Amanda. 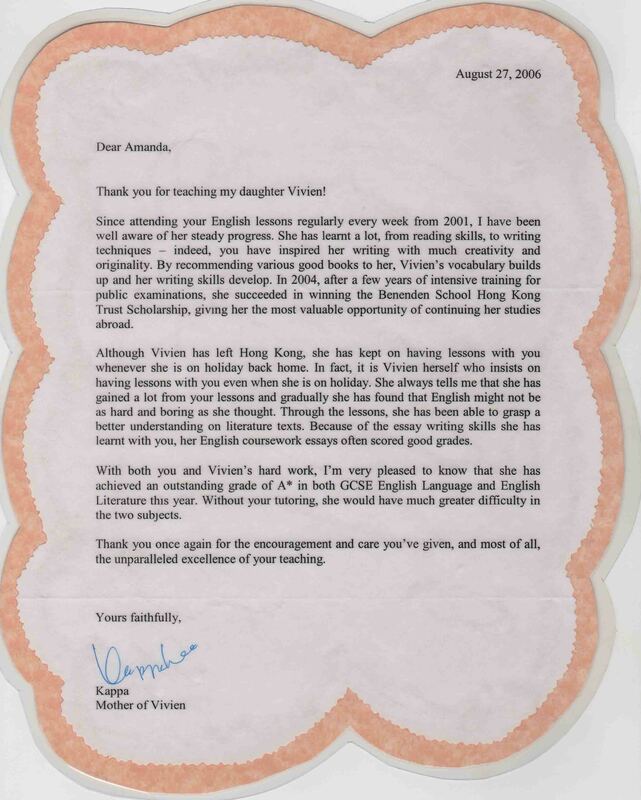 Finding an English tutor is easy, but finding a responsible and dedicated English tutor like Amanda is very difficult. And I am very pleased that my son has the chance of having Amanda as his tutor. My son, Michael, was studying at a local school where the English standard was not very good. As my husband and I had decided to put Michael in an international school, we saw the need for him to improve his English language skills. So we started looking around for a private English tutor for our son and very fortunately for us, and of course for Michael, we found Amanda. At that time, we were planning to have Michael apply to two reputable international schools where the English standard is high, considerably higher than what Michael was exposed to in the local school. 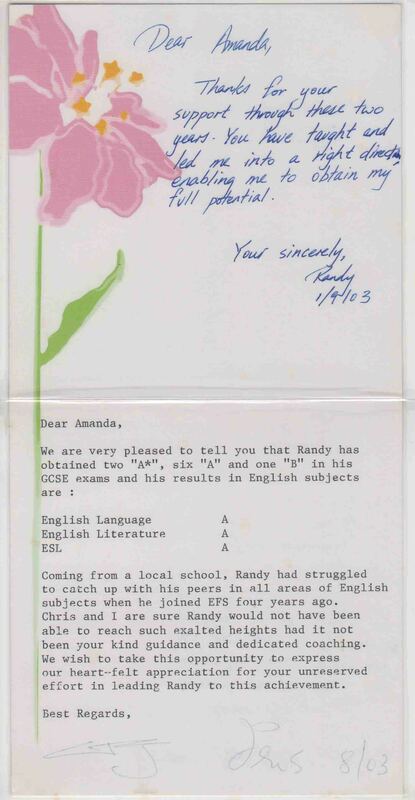 In order to prepare him for the entrance examinations, Amanda spent much time and effort to improve Michael's grammar, reading, comprehension and writing skills. At the very beginning, Michael was totally bewildered because his English standard was a far cry from the requirement. However, undaunted by this, Amanda persistently and systematically drilled Michael in all areas - grammar, reading, writing and comprehension. Through her untiring efforts, Michael passed the entrance examinations of both schools. Several things about Amanda's teaching that I especially appreciate. First and foremost, she is a very serious and demanding teacher who is willing to put in her best efforts and expects the same from her students. Knowing that Amanda expects him to try his best, Michael has put in extra efforts to complete her assignments. I believe that it is Amanda's serious work attitude that the students benefit from her teaching. Secondly, unlike many native English teachers who do not teach grammar, Amanda has systematic grammatical exercises to drill her students. This I think is important as knowing the mechanics of a language is important for proper expression. Furthermore, I appreciate Amanda's way of teaching composition, which in my opinion is a very difficult subject to approach. 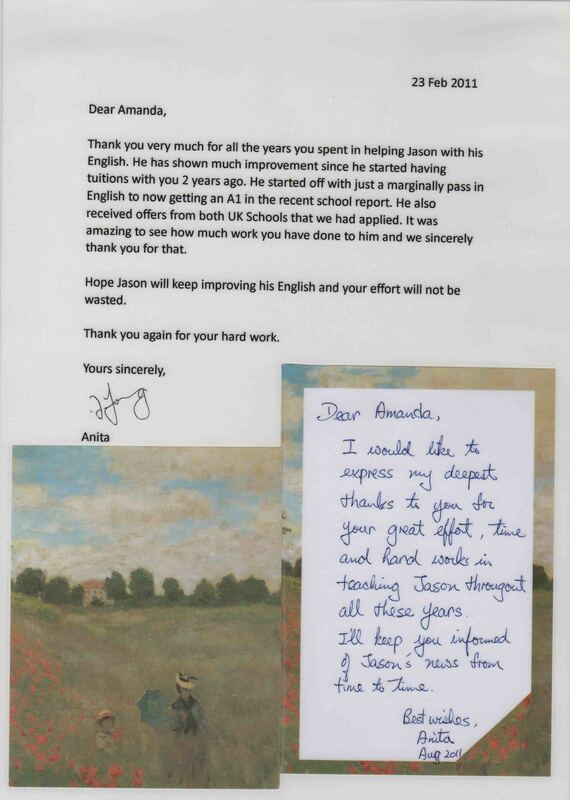 Through taking lessons from Amanda, I can see Michael's improvement in his written work. Over the years, Michael has learned a lot from Amanda - in all areas of the English language. Now he is approaching his English assignments at school with aplomb and enthusiasm. I think Amanda's help is one of the main contributing factors for this. I thank her very much for her help. Thank you for helping Gregory, Philippa and Alister with their studies. 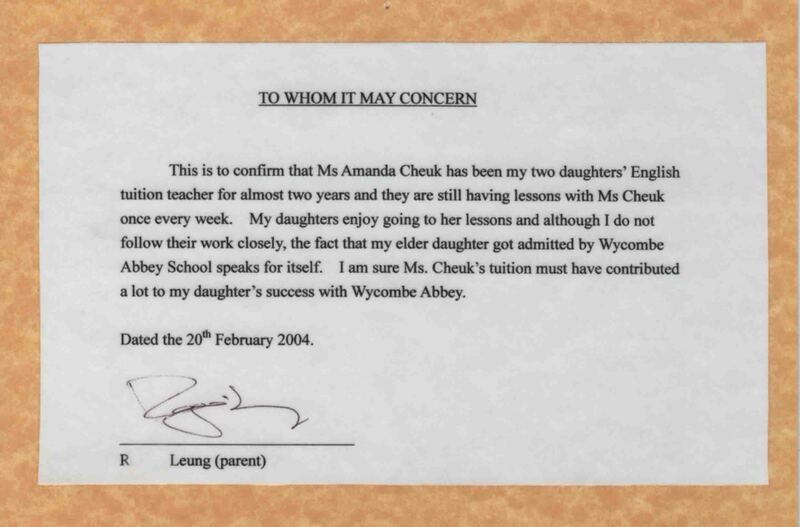 Amanda has tutored my elder son in English for his Winchester Entrance examination in May 2003, my daughter in English for her 12+ Wycombe Abbey Entrance examination in May 2004 and my youngest child in his English and Latin Winchester College papers in May 2006. My children were all accepted into their respective schools and we agree that it could not have been done without Amanda's help. She is a wonderful and dedicated teacher who always brings out the best in her students. She is helpful, dedicated and is always there to encourage and motivate my children. Amanda is particularly strong in teaching Shakespeare's plays and poetries. I am extremely grateful to her for helping them throughout these years. Ms. Amanda Cheuk has been teaching my daughter Claudia since two years ago until now. Amanda teaches both English and French for Claudia, she proves herself very professional on both subjects and Claudia accomplished a great deal especially it was proven on Claudia's examination results. She has helped Claudia get into both St. Swithun's School and Cheltenham Ladies' College in England. We have no hesitation to recommend Ms. Amanda Cheuk to any students on her teaching careers on above subjects and best wishes on her future teaching developments. Thank you very much for all the years you spent in helping Jason with his English. He has shown much improvement since he started having tuition with you 2 years ago. He started off with just a marginal pass in English to now getting an A1 in the recent school report. He also received offers from both UK Schools that we had applied. It was amazing to see how much work you have done to him and we sincerely thank you for that. Thank you again for your hard work. Amanda has been teaching English and French to my daughter Vicky and my son Philip. Amanda plans the lessons ahead, which benefits the students a lot. She knows what she is doing in class, and is very organised. 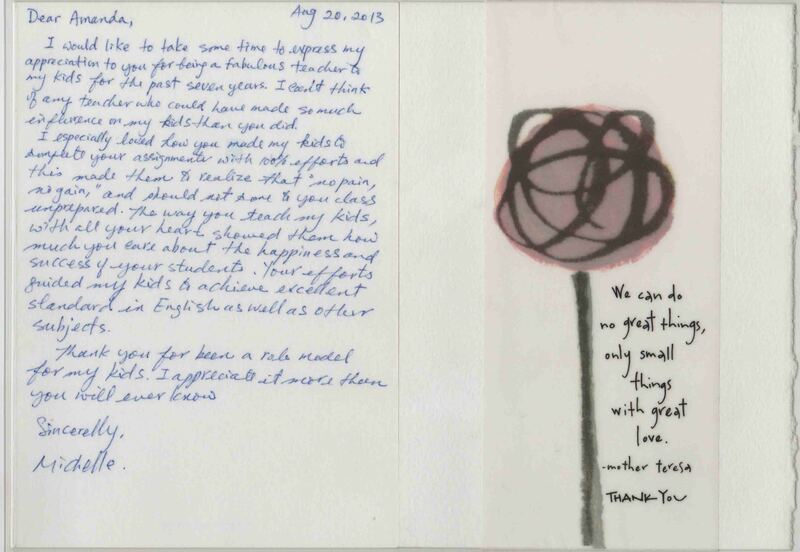 Amanda still marks and checks the papers even when her students are overseas, via e-mail. She also tries to fit the time slots in as manageably as possible. I appreciate what Amanda has done and what she is doing for my children.